What do I need to adjust to fix the nose? I believe this is a recent cura bug. but even if they fix the bug the nose would be improved if you put a tower next to this print that is at least one layer taller such that after it prints each layer it goes over to the tower. This also allows the nose to cool a few extra seconds which can make a big difference. The tower base should be 20% as much as the height (a 5 to 1 ratio). You can even make the tower cone shaped or pyramid shaped as long as you keep the 5:1 ratio throughout. I have a file called cube.stl that is very handy. I can add it to cura at any time and using scaling feature make it any dimensions I want in cura. I sometimes add this as a tower next to a print that has a small top. Like your nose example. By the way - if you tilt those masks by say 45 degrees the resolution/quality will improve greatly. 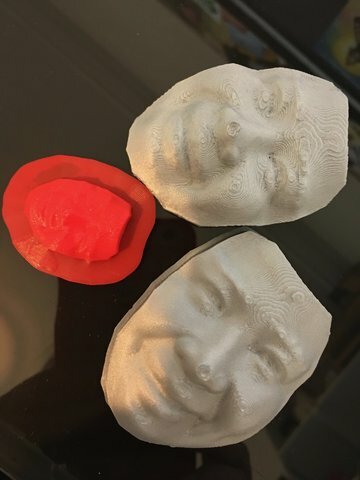 When I have to print a face, it is never from the angle shown above. I usually go straight and not at an angle. Less support that way. But the horizontal lines look much better on that type of surface instead of the topological map you get here. Thank you. Will try the tower option. I do like having the texture I get with positioning it this way. Besides, it's less obvious when printed really fine (at least on my other printers).